Scars and stretch marks can be disfiguring or cosmetically displeasing, but did you know they can also have emotional effects including anxiety and depression. At Impressions MedSpa skin beauty is our passion and we get serious about our results. If you have scars or stretch marks that are bothering you in any way, Dr. Damery at Impressions MedSpa can help. Dr. Damery offers free skin consultations and a variety of state-of-the-art treatment options — all minimally invasive and with minimal to no pain. To learn more, call Impressions MedSpa to schedule a free consultation. Or, just click the “Book Online” button. Scars are marks left on your skin after a wound resulting from either acne, an accident, or surgery. Your body creates a building block protein in the skin called collagen to reconnect injured tissues. While your body is doing this repair work, it creates a scab over the wound to protect it from germs. The scab eventually dries up and falls off, but the new skin often has a different texture and different quality than the surrounding skin. This new skin is what we call a scar. Stretch marks are indented streaks in the skin that often appear on the stomach, breasts, hips, buttocks, upper arms, and thighs. The medical term for stretch marks is striae. Stretch marks develop when the skin reaches it maximum point of stretching. When the skin is stretched beyond the limits of its elasticity, a tear in the middle layer of the skin (the dermis) occurs. Stretch marks and most scars are not physically dangerous but can cause problems with self-image and anxiety. For some people, stretch marks are a significant cosmetic concern that can affect day-to-day living. Scars and stretch marks do not go away by themselves, but over a course of many months may lighten and become less noticeable. Through the use of modern laser devices a significantly visible improvement is readily achievable. 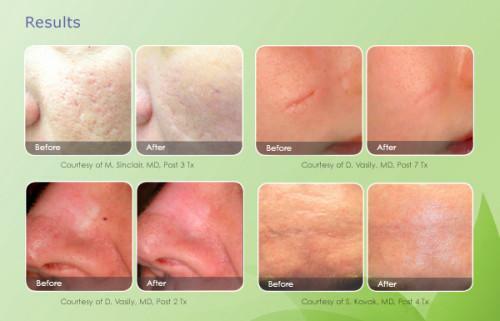 Dr. Damery at Impressions MedSpa has state of the art equipment that can do wonders for scars and stretch marks. Take a look at typical improvements that are achievable with our devices. Call Impressions MedSpa or click the online schedule button a free consultation with Dr. Damery to discuss your scar or stretch marks issues. You’ll be glad you did.